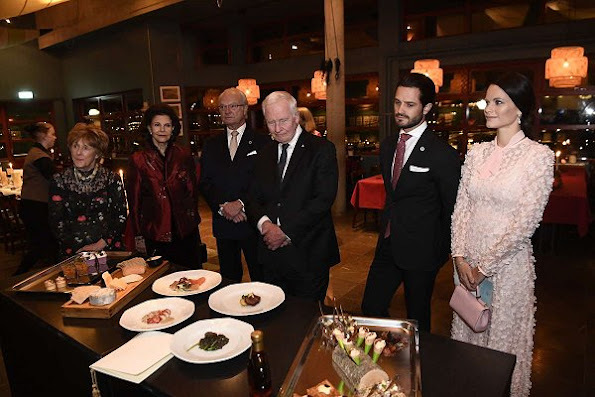 King Carl Gustaf, Queen SIlvia, Princess Sofia and Prince Carl Philip of Sweden attend the lunch held for the David Johnson and his wife Sharon at the City Hall on February 21, 2017 in Stockholm, Sweden, . 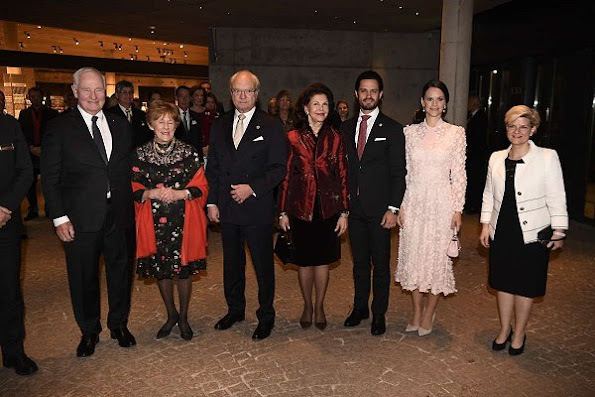 The General-Governor of Canada is on a four-day State visit to Sweden. 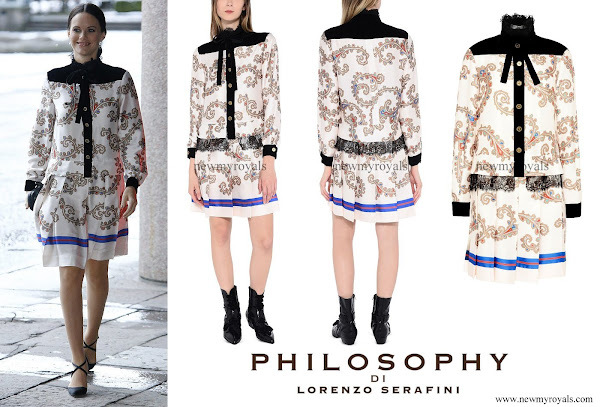 Princess Sofia wore Philosophy di Lorenzo Serafini Dress. I am confused by Sofia's outfit. My eyes hurt. 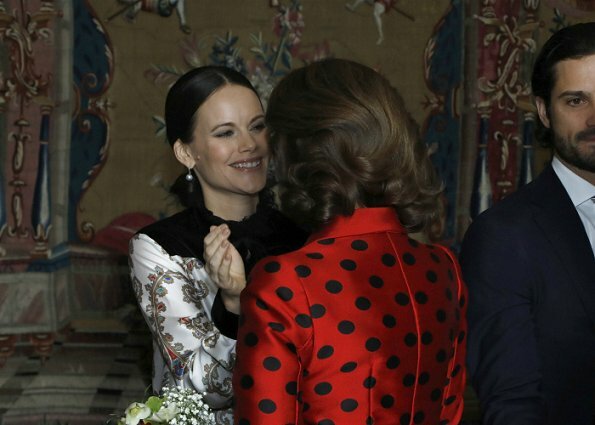 However, I like her warm interaction with Queen Silvia. That is nice to see. Yes I think she has a very good relationship with her in-laws. It's very nice to see. Sofia's dress is an unmitigated horror, and Silvia's jacket is not much better. Which is a shame, both of them so beautiful women! Their clothing doesn't detract from their physical attributes, but Sofia in particular seems to have a knack for dressing badly. Sofia's dress is just too busy and fussy [my eyes, my eyes...]. I rather like the queen's jacket - that and the king's tie are a nice compliment to Canada's flag colour. Sofia and her mother-in-law seem to get along well. Nice to see. The outfit it's just ugly but the colors of the dress are great. They both look like harlequin and clown. At least the blue stripe in Sofias dress matches with her husbands suit. More photos!!! Okay, Sofia's pink dress is a lovely colour but that's about it. Is it covered with petals? The queen's second jacket is awful with a badly positioned closure and no shape. 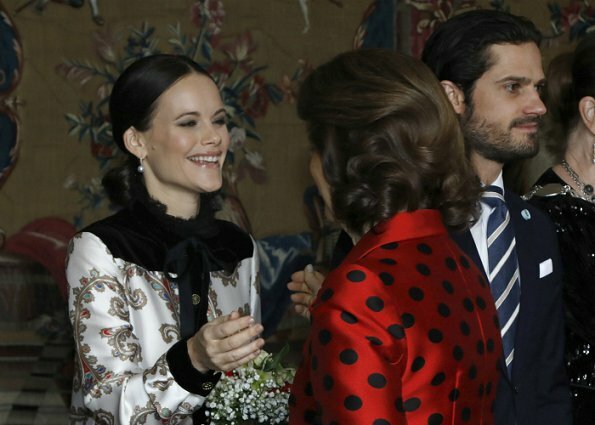 Princess Sofia looks very beautiful in this dress. Soft, youthful and fresh look. I actually quite liked the top part of Sofia's dress at first sight... then came photo no.4 with the full look and it left me... speechless. Not in a good sense of the word. And the second outfit isn't better either. That dress looks like it's covered in spitballs. A lot of spitballs. I don't like Q Sil's spotted jacket either. By the way, I wouldn't let myself be misled by Silvia and Sofia's apparently affectionate greeting. They are in public, in front of cameras and they know it. It might be real... or not. Me too. 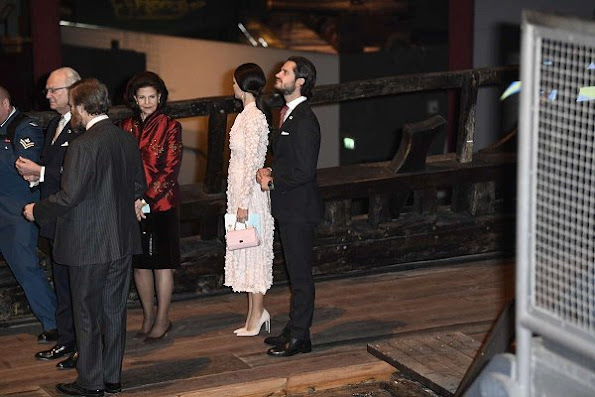 Viewing the first photo, I thought that Sofia´s outfit was interesting. But something so busy up the top really needed to be complemented with something simple and calm, and the skirt part of her dress does the opposite. The blue strip is jarring, and the black panel ending randomly halfway down is weird. If the top had been a blouse, and combined with a simple A-line black skirt, the look had been alright, I think, like a bit 70s retro but still elegant. I think Sofia's second dress is super pretty. Nice pale pink that suit her colors very well. By the way I'm not only commenting on Sofia and Silvias relationship from this picture, but in videos and other pictures. Body language says a lot. What could one do with all that money, spending for those outfits?! Words fail me. Sofia in the pink dress is lovely and she looks very sweet. The first dress is different but I kind of like it. I don't like the queen's red polka dot jacket, and who is the lady in black with that thing around her neck? it looks like a strand of coins. Probably that thing around her neck is her old-age provision and she prefers to have it on hand whereever she is? I like both of P Sofia's dresses..she looks pretty and appropriate.. especially in the second dress. 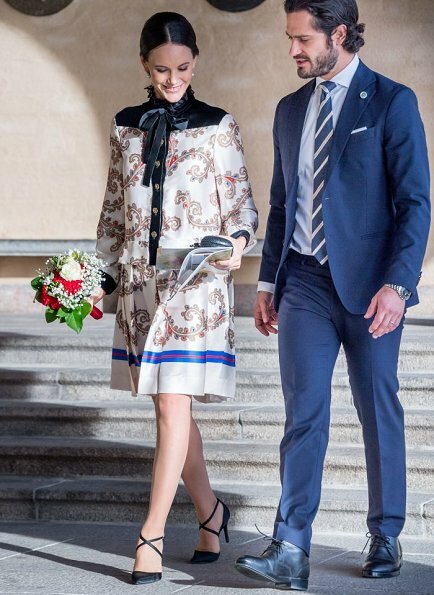 I like Sofia´s first dress, I think it is kind of brisk. The second one would have been lovely when seeing it in normal light, but these flash lights and little existing light do it no justice. HM jacket is lovely, love the ladybird print. If Sofia'sweden daytime look was a blouse that print with a pencil skirt it would have been better in my opinion. She still looked good. I think her nighttime look was great again. Love her hair and earrings. I am kind of over such neutral shoes all the time. I wish more royal ladies would be bolder in their footwear choices. 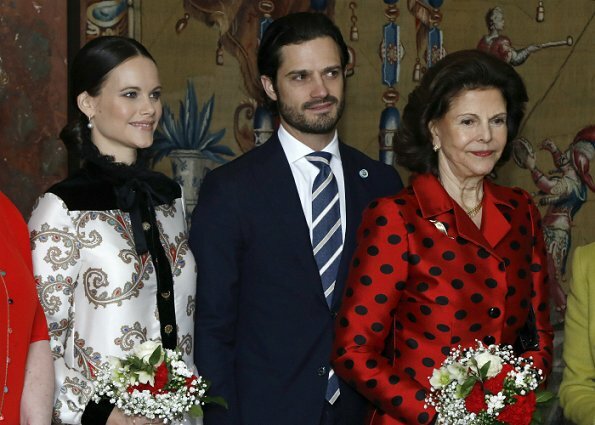 Queen Silvia looks like a ladybug! Sofia's pink dress is nice, maybe a bit too long. I do not like either of sophia's outfits. The first one is too busy, she is too small to carry it of and the second one................what can I say, not appropriate for the occasion and totally not her style. She is not a romantic person. Sophia's outfit....the only thing i can say is NO! A non-fashion observation: why does the king stand sideways like that so his back is to the person next to him. It's particularly rude if it's a woman, and more so if it's his wife. Please the King must never again wear a RED tie. A red tie fits the so-called newly elected, so-called super hero, crazy dictator of the USA. My first impression was Sofia outfit looks pretty; then I scrolled down. Uh-oh! 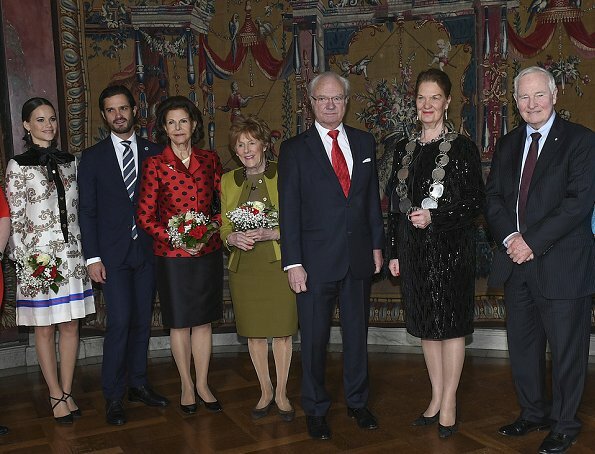 I don't like Sofia's or Queen Silvia's daytime outfits, both are too busy, too much. Evening attire was a little better, a pretty colour on Sofia, although a bit too fussy for my taste and for the Queen a bit too shiny for my taste.